Martial arts expert Ma is set to replace Chan as the head of a successful crime investigation police unit, when Chan wants an early retirement. Chan sends an undercover agent to get close to Po, an upcoming figure in the underworld and Jack- Po's cold-blooded right-hand man. When the undercover agent is found dead without a trace of evidence. The opening shot of a clear oceanic view resemblance more of a romance genre, you might have assumed two lovers will be running towards each other in the next shot. On the contrary, beneath this tranquil environment, a hard-hitting gritty tale of crime and grime is about to be told. The story plot is basically lifted from the many HK cops-and-robbers thrillers from the 80’s and early 90’s. Instead, the real gem comes from the casting, Veteran Simon Yam who plays a tough cop who has been trying to nail down crime lord, Sammo Hung over the years and action star Donnie Yen as the incoming police officer. Apparently, there’s insufficient time for the director to hanker over some commonly found romance sub-plots and what you get here in “SPL” is a condensed 90 minutes of intense action and storytelling. Donnie Yen (who is the action director as well) brings a new edge to the art of action choreographing. The action sequences are ultra-slick, sharp and hard. Look out for the alley fight between Donnie and relatively newcomer Wu Jing (a cool baddie who kills his opponents without even batting an eyelid) and the finale with Donnie Vs Sammo. Surprisingly, given his weight and age, Sammo still fight an old pro who reminds us of his good old days with Jackie “Superstar” Chan and Yuen Biao. 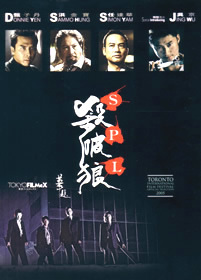 Shot in mostly shades of dark greys and blues, “SPL” is a welcome change from the usual lackluster HK productions in recent years. Never mind the less than satisfying plotlines but the chemistry of the cast and action sequences fully make up for it.